* You may use your organization’s PowerPoint template to format the information for the following 9 slides * Please do not exceed the 9 slide limit * Bring. 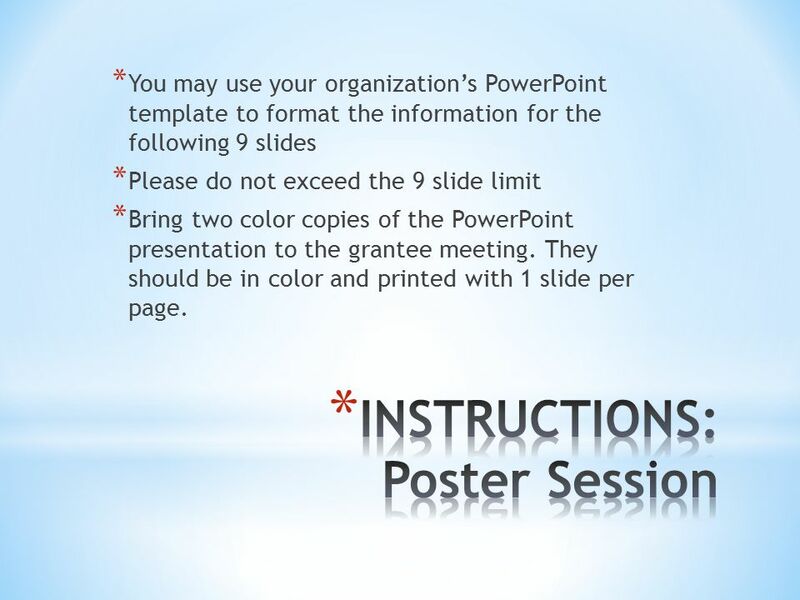 1 * You may use your organization’s PowerPoint template to format the information for the following 9 slides * Please do not exceed the 9 slide limit * Bring two color copies of the PowerPoint presentation to the grantee meeting. They should be in color and printed with 1 slide per page. 3 Integration model used is the Assertive Community Treatment (ACT). 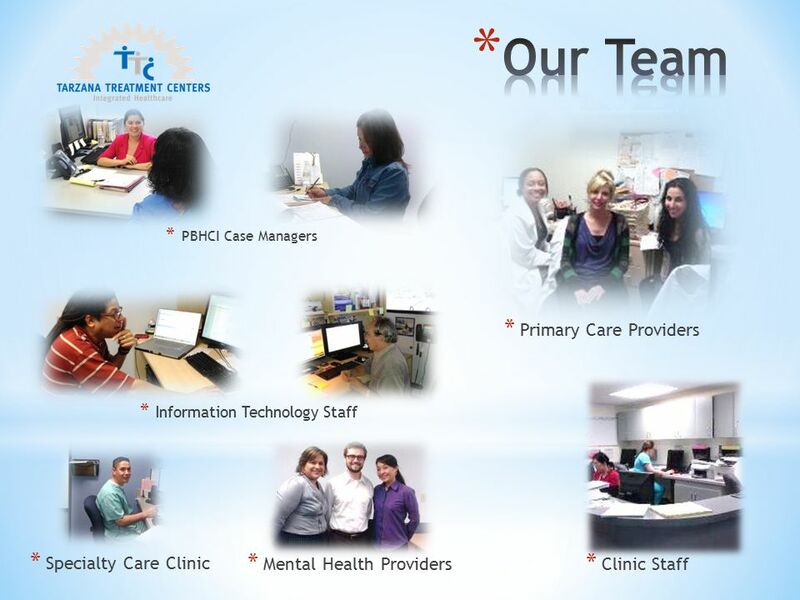 Strategies used to incorporate primary care are co-location within the mental health center, monthly team case reviews, use Information Technology, on the fly “team huddles”, and cross training to name a few. Enrollment target = 250 patients. Special populations served are those adults with Chronic Health Conditions, Serious Mental Illness and, in many cases, Addiction. Our setting is urban. Los Angeles is the 13th largest metropolitan area in the world and the second-largest metropolitan area in the United States. Wellness services offered are health education groups and one on one sessions, tobacco cessation program, morning walk and preventive medicine. 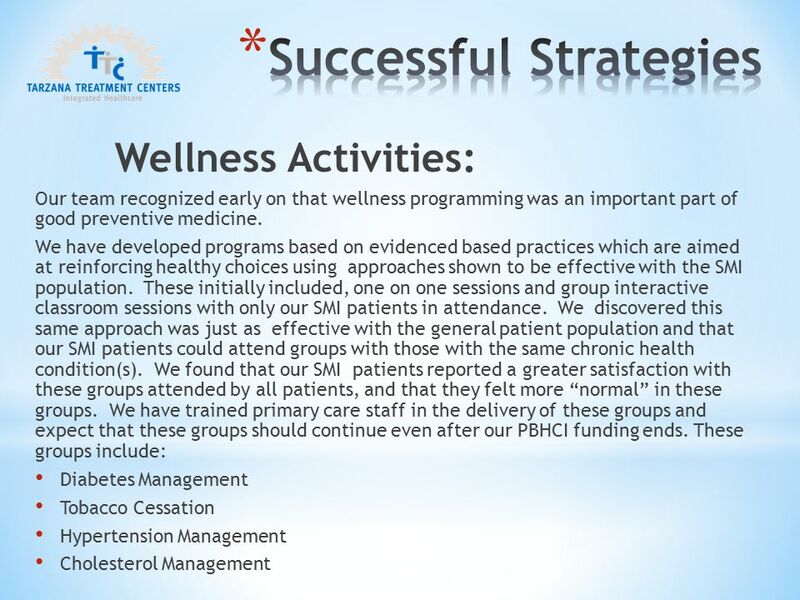 Use of peers at PBHCI is limited to their involvement in the Community Advisory Board and participation in groups. 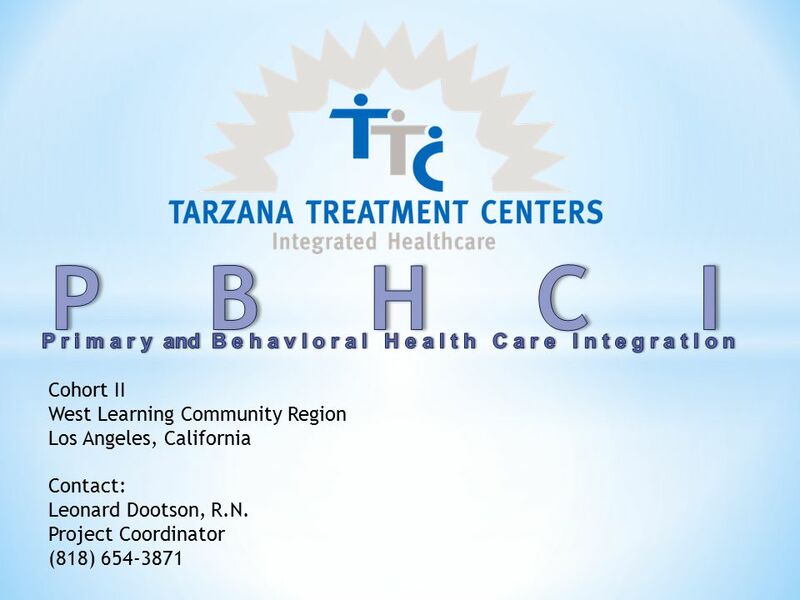 EHR vendor Is Tarzana Treatment Centers provides integrated primary care and specialty care for mental illness, substance use disorders, and HIV/AIDS. 6 Finance/Sustainability: * In 2014 medical care for patients all patients dependent on Safety Net providers will be provided under a Managed Care model. 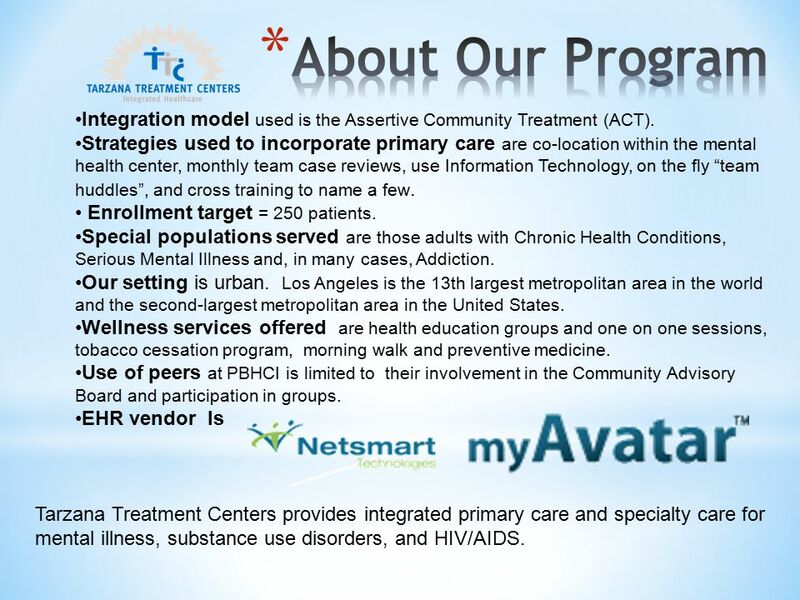 Our strategy is to learn how to work effectively in an environment where primary care is capitated and MI/SUD care is carved out to Los Angeles County. * In 2011 – 2012 Seniors and Persons with Disabilities (SPDs) were moved to managed care. 66% of the patients enrolled in our program this year are SPDs. * In 2012 – 2013 Dual Eligibles will move to manage care and we will include more of them in our patient population. 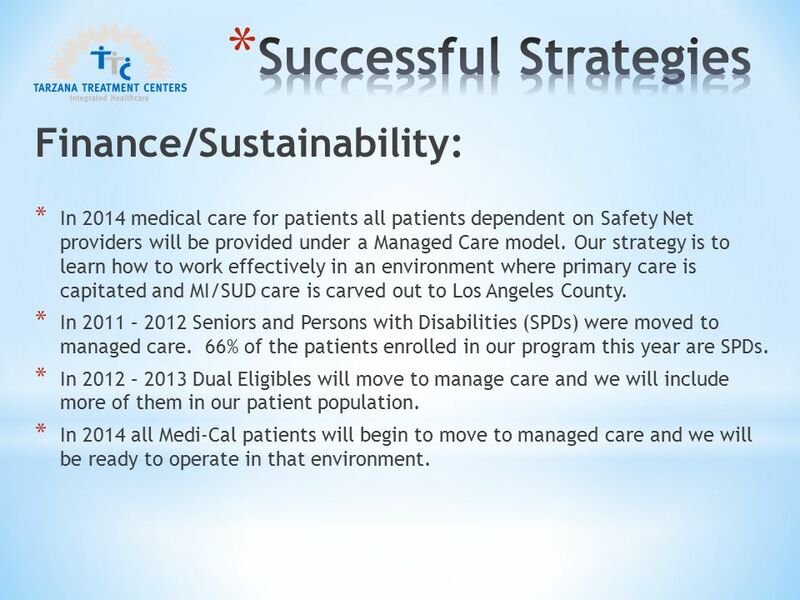 * In 2014 all Medi-Cal patients will begin to move to managed care and we will be ready to operate in that environment. 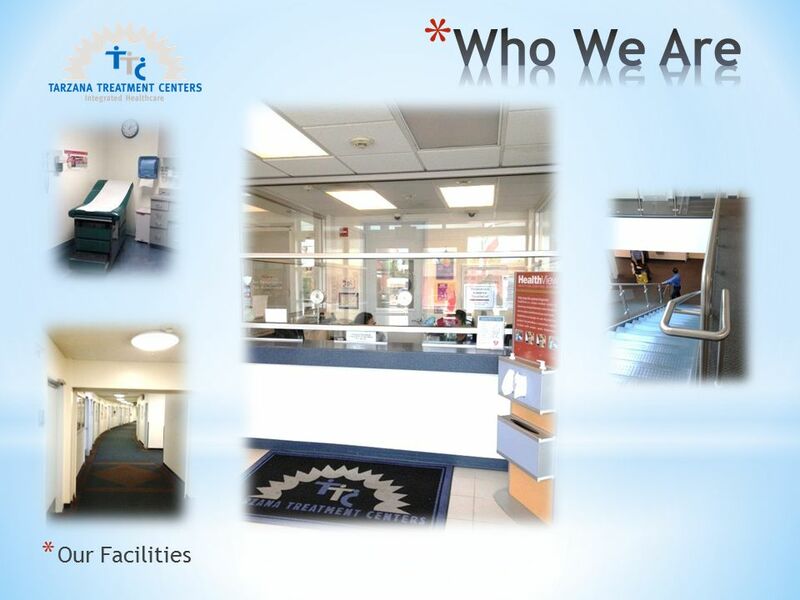 7 Heath Information Technology: Tarzana Treatment Centers (TTC) invested heavily in Information Technology early on and, as a result, has built out a robust infrastructure on which to deploy our Health Information systems. TTC also received a SAMHSA HIT supplemental grant which is enabling us to meet meaningful use criteria and use this as a starting point for the implementation of an Electronic Health Record shared by Primary and Behavioral care providers. 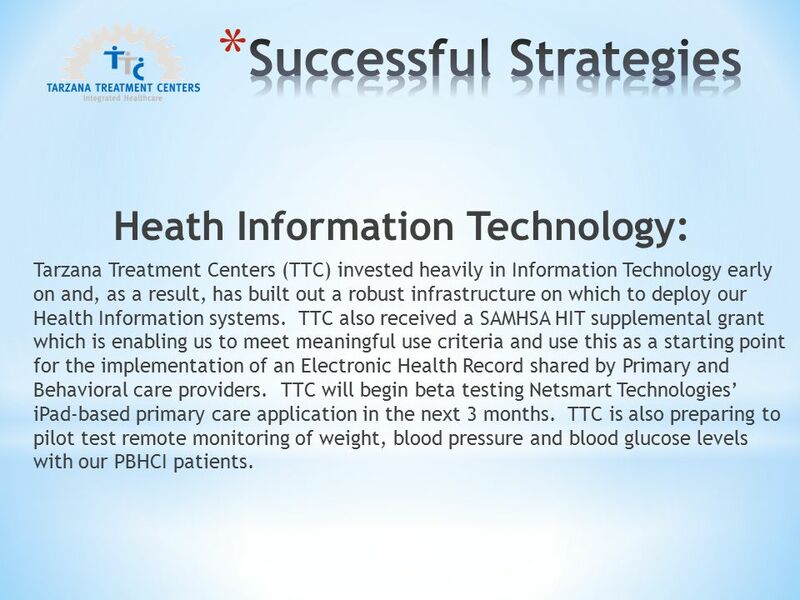 TTC will begin beta testing Netsmart Technologies’ iPad-based primary care application in the next 3 months. 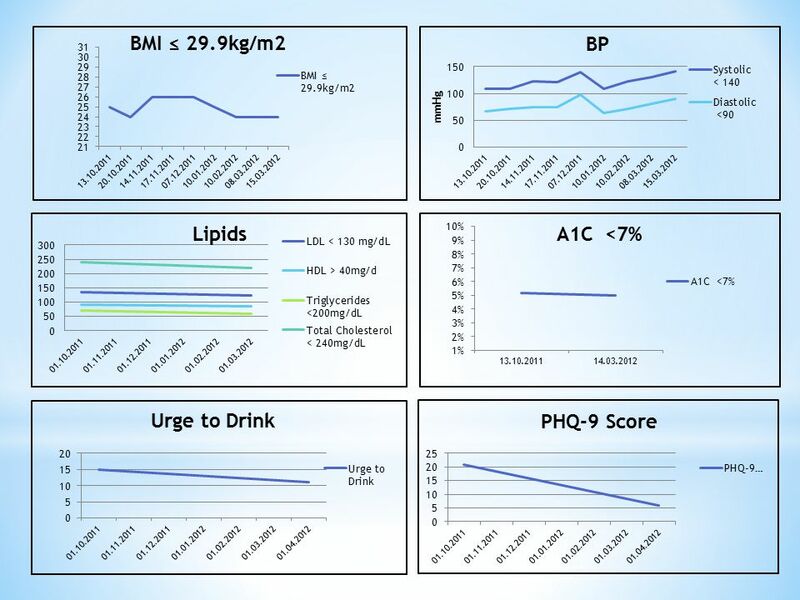 TTC is also preparing to pilot test remote monitoring of weight, blood pressure and blood glucose levels with our PBHCI patients. 10 Sustainability * Clinical: Our next major step will be the implementation of an electronic health record for patients in primary care. A key focus will be to use that EMR to support pursuit of NCQA PCMH level 1 certification. 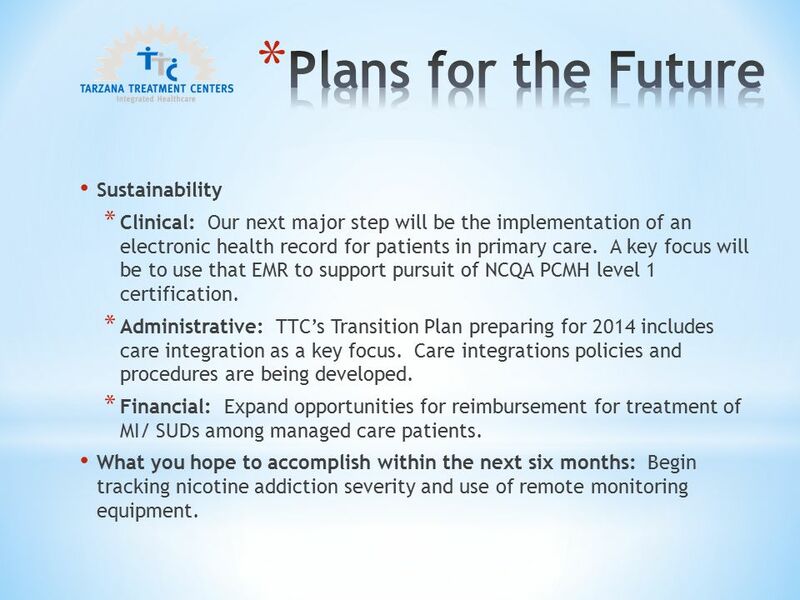 * Administrative: TTC’s Transition Plan preparing for 2014 includes care integration as a key focus. Care integrations policies and procedures are being developed. * Financial: Expand opportunities for reimbursement for treatment of MI/ SUDs among managed care patients. What you hope to accomplish within the next six months: Begin tracking nicotine addiction severity and use of remote monitoring equipment. Download ppt "* You may use your organization’s PowerPoint template to format the information for the following 9 slides * Please do not exceed the 9 slide limit * Bring." Centerstone’s Building Exceptional Wellness (BE Well) Program Centerstone of America Cohort II Learning Community Region IV Bloomington, Indiana Maren. PRIMARY AND BEHAVIORAL HEALTH CARE INTEGRATION SEPTEMBER 30, 2014 The Governor’s Health Summit. WIN Program Wellness Integration Now Community Health and Counseling Services Eastport Healthcare Cohort II Learning Community Region 5 Machias, Maine. Mercer County Integrated Care Collaborative Catholic Charities, Family Guidance, All Access Mental Health, Greater Trenton Behavioral Health Henry J Austin. Transforming Clinical Practices Grant Opportunity Sponsored by CMS. Addressing Severe Mental Illness and Physical Health Issues: A Ground-level Perspective From A Community Behavioral Health Organization Greater Cincinnati. HEALTH, WELLNESS AND LONGEVITY INITIATIVE Magellan Health Services of Arizona Clinical Initiatives.